Last month in Atlanta’s Centennial Park, Herman Cain announced his candidacy for president. Cain is one of a growing number of minority Republicans who are disillusioned with the policies of President Obama and the Democrats. Cain is a native Georgian who grew up in Atlanta. He was born on December 13, 1945 and graduated from Morehouse College with a B.A. in mathematics and physics in 1967. He earned a Master’s degree in computer science from Purdue University in 1971. Cain began his career as a civilian employee of the U.S. Navy where he helped to design fire control systems for ships and aircraft. He also worked in computers for the Coca Cola, Co. after returning to Atlanta. Next, he was hired by Pillsbury, where he became vice president. In search of a challenge, Cain decided to learn the restaurant business from the bottom. He transferred to Pillsbury’s Burger King division where he became the regional vice president. In that capacity, he was responsible for transforming a low performing region into the company’s top performer. Next, he was hired as the president and CEO of Godfather’s Pizza, another Pillsbury company. When he started the job, the company was on the brink of bankruptcy, but Cain was able to return the company to profitability in only fourteen months. In 1988, Cain led a group of investors that purchased Godfather’s from Pillsbury. He continued as CEO until 1996. Cain also became a member of the board of directors of the Federal Reserve Bank of Kansas City in 1992. From 1995 to 1996, he served as chairman of the board. He resigned in 1996 to serve as an economic advisor to the presidential campaign of Bob Dole. Cain has never held a publically elected office. His only previous foray into a political race was in 2004 when he competed in the Georgia Republican primary for the nomination to succeed Senator Zell Miller. Cain lost the primary to Johnny Isakson who went on to win the general election as well. Cain placed a distant second with twenty-six percent of the vote compared to Isakson’s 53 percent according to the Washington Post. 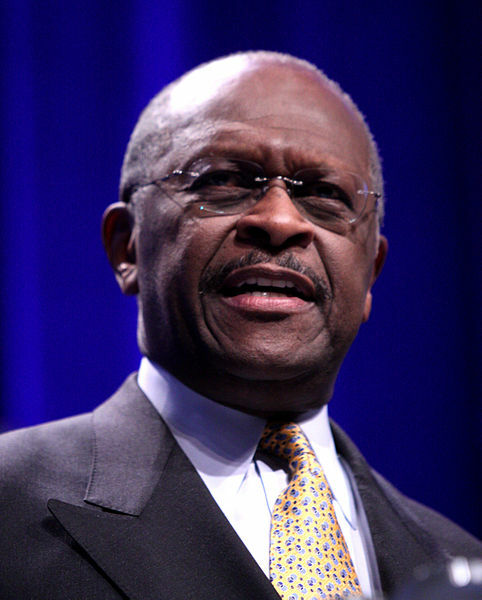 More recently, Cain has worked in the media as a syndicated columnist, analyst on the Fox Business network, and host of the “Herman Cain Show” on Atlanta’s WSB AM-750. Cain also started the Intelligent Thinker’s Movement (HITM), a conservative group with the goal of organizing activists in every congressional district. He has also written several books about business and politics. In 2010, Cain was the emcee at a regional Tea Party in Douglas County, Ga.
Cain is also a long-time supporter of the Fair Tax. The Fair Tax, which would replace all federal income and payroll taxes with a national consumption tax, was championed by Mike Huckabee in 2008. Supporters say the Fair Tax would promote economic growth and make the U.S. more competitive in world markets. The Cain campaign has been hit by two scandals since he declared his candidacy. First, he was reported by Think Progress to have made the statement that he would not appoint any Muslims in his administration. Cain’s statement was due to his belief that many Muslims are trying to bring Sharia law to the United States and that they may have divided loyalties. In fact, Islam does permit Muslims to conceal their true beliefs under a doctrine known as taqiyah. In a statement on Fox News, Cain has since clarified that he would consider appointing Muslims who were “totally committed to the Declaration of Independence and the Constitution.” The Constitution prohibits a religious test for any public office. Second, there have been allegations that Cain, as a member of the board of directors of energy company Aquila, was complicit in the loss of $200 million from the employee retirement fund in 2002. An article in Mother Jones alleges that the board converted the company from an operator of power plants to an “Enron-esque” energy trader. According to a class action lawsuit cited in the article, the board was irresponsible in encouraging employees to invest their retirement money in Aquila, which was itself engaging in risky energy trades. In the end, many employees lost much of their retirement money. When he first emerged as a candidate, few considered Cain to be a serious contender for the White House. The first GOP presidential debate changed that perception. Cain was widely recognized as the winner of the May 2011 debate in Greenville, S.C. Nevertheless, Cain still has much ground to make up. In a late May Gallup poll Cain was in fifth place in the Republican field at eight percent. He trailed frontrunner Mitt Romney as well as Sarah Palin, Ron Paul, and Newt Gingrich. The margin between Paul, Gingrich and Cain is small enough to be considered a statistical tie for third place. In more recent polls, after the second Republican debate in June, Cain moved into double digits in several national polls. Nationally, his best showing was in a Public Policy poll on June 12 where he garnered 17 percent. In an Insider Advantage poll of Georgia voters, he won twenty-six percent. Cain is widely considered a Tea Party candidate. His success may ultimately depend on whether voters sympathetic to the Tea Party align with him or Rep. Michelle Bachmann.